Strawberry, Vanilla and Chocolate Mille Crepe Cakes @ Food Foundry; Your Neighbourhood Food Provider in Section 17, Petaling Jaya. Almost immediately after the dinner at My Elephant, we ventured over to Food Foundry to fulfill our intention for desserts and coffee; having in mind the preliminary perception that the latter would be a comfortable, swanky cafe perfect for an extended chat. It was a horrendously warm evening; and the spicy Tom Yum from My Elephant contributed much to the beads of sweat forming on our foreheads. Food Foundry‘s tagline is “Your Neighbourhood Food Provider”. Never pretentious enough to suggest that they’re a fine diner, a bistro or cafe, or even a restaurant. And they’re just that. No air-conditioning, they’re situated on the ground level of B block of Happy Mansion flats occupying two lots separated completely from each other by a wall adorned with a large mirror, with walls painted with quirky/colourful birds and trees and exuding a very laid-back aura. A page full of desserts to shift that carefully put-to-practice resistance motion of yours. Their menu is a very back-to-basics compilation of A5 sized colour papers; clipped onto a wooden board. This was the ONLY place serving Mille Crepes, aside from the now-legendary Nadeje in Malacca. But over the years, several other cafes in the Klang Valley started jumping on the bandwagon, though not as prominent as the manic cupcakes/macarons fiasco. 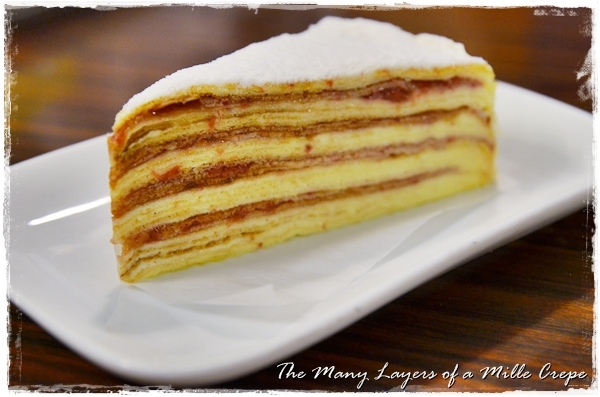 Strawberry Mille Crepe (RM9/USD3) – >20 layers of thinly-formed crepes sandwiching the cream and strawberry jam in between, then chilled to the right temperature before serving. Verdict? Not as magnificent as Nadeje’s. 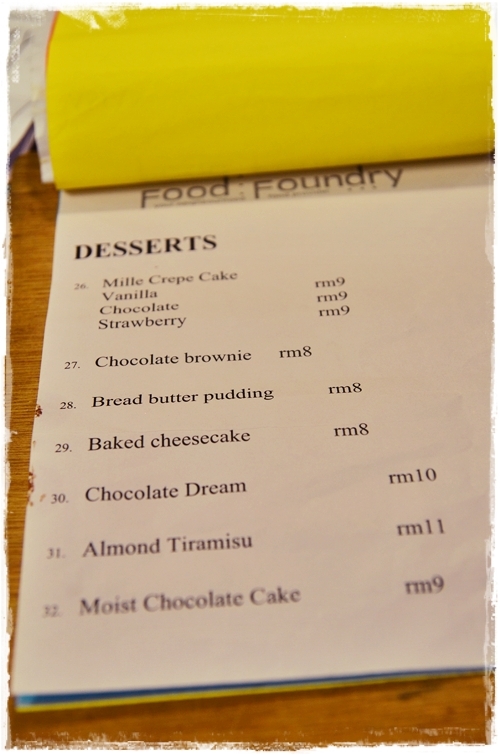 Only 3 flavours on the menu, and the cakes at Food Foundry suffered from a slightly soggy texture; not as fluffy as Nadeje’s nor the cream as luscious. Could not put my finger on it, since we were sharing the cakes and the different flavours were not of significant difference between each other. The chocolate and vanilla versions were slightly better than the strawberry in my opinion. Do bear in mind that Mille Crepes are NOT easy to make. “Mille” meaning “thousand” in French, so you can relate to the immense effort in creating paper thin layers after layers of pancake; but not before painstakingly spreading on top of each crepe a thin layer of cream/jam. 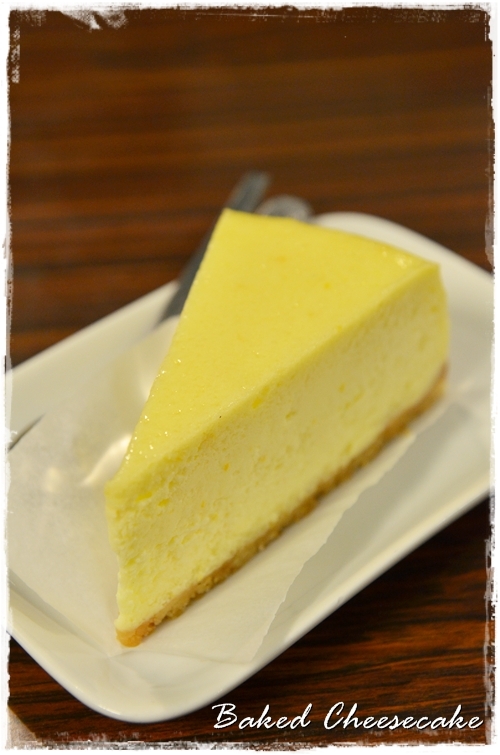 Baked Cheesecake (RM8.00/USD2.70) – Simple, dense texture with a naturally decadent nature yet not overwhelmingly cloying. 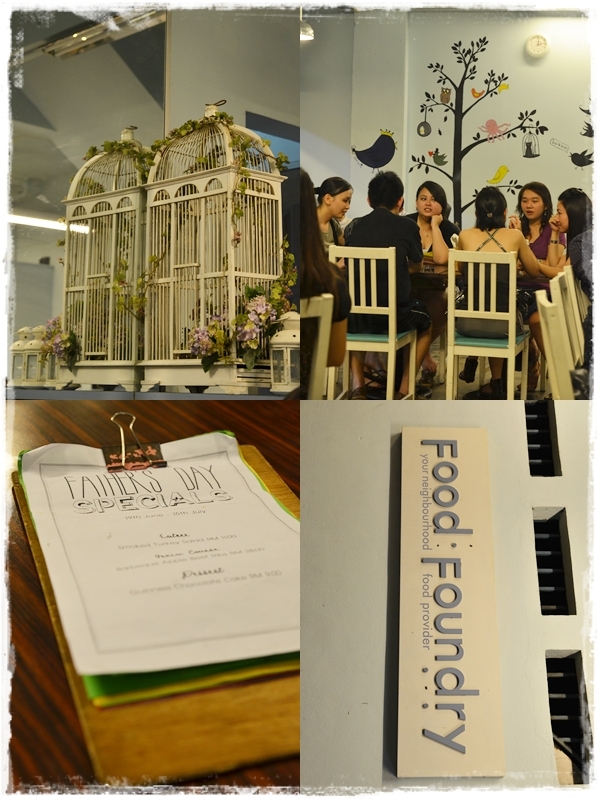 Food Foundry serves various cakes, pastas, sandwiches, chops and more. But try coming on a cooler day, as opposed to the stagnant, humid warm air circulating on that night. It felt like as though we were stuck in a horrid oven; since we were seated furthest from the open entrance. But then again …. the weather’s been so erratic lately, it’s hard to gauge when’s a bearable day for dining al fresco, and when’s the perfect time for eating with full-blown air-conditioners. You can follow them on their Facebook page for more updates and information. They will be renovating soon, and keeping my fingers crossed for a positive transformation. Hey … yeah, was certainly not we had in mind, but can see why it works though. Good idea to refurbish and move with the times, I guess. The Mille Crepe here always brings back the fondest of memories … Ah ha, thanks to you, I now know there is a “challenger” in Melaka! Cheers from Abu Dhabi 🙂 Can’t wait to be home in a couple of months to rekindle my love for Malaysian makan! Hi Julian … yeah, so Melaka’s considered a challenger now? Dunno which one started this trend, but damn sure Nadeje has made quite an impact there. Sounds like a nice place to dine, but I hardly visit Melacca. Mmmm… I remember long ago when it just opened, it was one of cheap n decent places to go for dinner….. 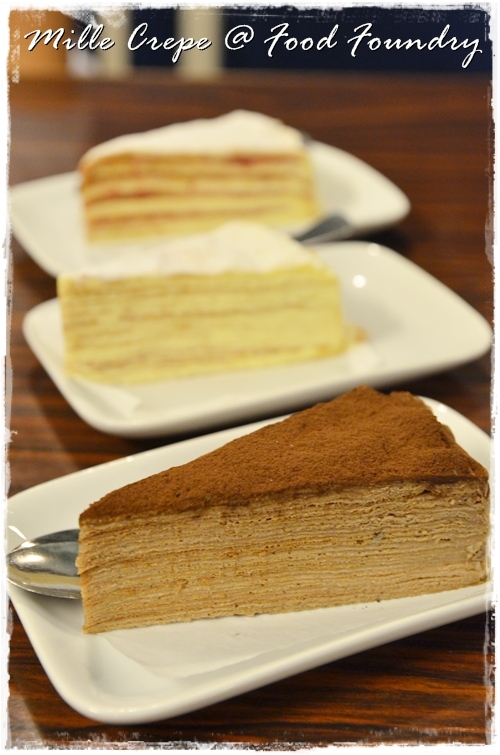 I really love Nadeje’s mille crepe.. the vanilla one is so gorgeous! Yes ah?! Nadeje to me, was still the better ones. Humble Beginnings is the other mille crepe specialist in Klang Valley. Maybe …. it’s that creaminess that warrants a try, no? Though I have heard that Nadeje’s quality has dropped from their glory days. may i know is there selling d whole cake instead of slices? Yes Canny. They do. Just call and reserve in advance.